As everyone knows, I have absolutely no taste in movies. This isn’t to say that I can’t recognize a good movie when I see it, this just means that I am perfectly able to enjoy a movie when I recognize that it isn’t good. I’m back at my parents house this week for Reading Week, which means I have TMN and TMNonDemand. I was browsing through the movies and I found Chaos Theory. I decided to give it a try, because I really do love Ryan Reynolds, especially since Definitely, Maybe. Chaos Theory was such a good movie. It had the right amount of thought balanced with plot, and the characters were completely compelling. Emily Mortimer was in it, too, and I really like her. Ryan Reynolds, for the first and last bit of the movie, was supposed to be about 45, and I honestly believed it! Although, I thought he was Hugh Laurie at first, which is very entertaining. The rest of the time, he reminded me a little of Jim Carrey in the Number 23. But less neurotic. Sort of. The movie is about a man who obsessively controls his life using lists and precise organization. He even wrote a book and does a lecture series about time management. And then, after one weird night, his whole structured life falls apart and he decides to never make any decisions ever again. And so while technically the movie is about life and choices - it’s mostly about love. And it made me cry. I really enjoyed it. 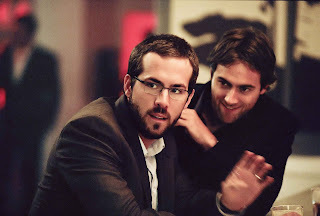 I also really enjoy Ryan Reynolds with a beard. See above.